1. Preheat the oven to 180°C, gas mark 4. Roll out the pastry on a lightly floured surface, large enough to line a 25cm fluted tart tin. Carefully lift the pastry over the tin, allowing any excess to overhang the edges. Line the pastry with a sheet of baking parchment and fill with baking beans. Place the tin on a baking tray and bake for 30–35 minutes until golden. 2. Turn off the oven. Remove the parchment and baking beans and return the case to the cooling oven for 10 minutes. Trim the edges with a sharp knife and leave in the tin to cool completely. 3. Place the mascarpone and whipping cream in a large bowl. Cut the passion fruit in half and scoop the flesh into the bowl, then add the orange curd and sugar. Using an electric whisk, beat together until the mixture forms soft peaks. 4. Spoon the passion fruit mix into the cooled tart case, levelling off the surface. 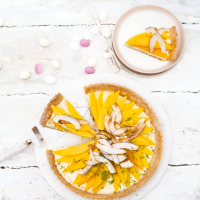 Arrange the mango slices on top of the tart then scatter with the coconut shavings and lime zest. This recipe was first published in Thu Feb 25 14:45:00 GMT 2016.